A S E N N E C A C O M P A N Y Controlling insects and climate should be an eff ortless process in your application. Invest in high quality products that both you and your personnel will appreciate with the E-IBD (Eff icient Insect Back Door) Air Curtain and the Pest-Pro 150 Bug Light from Curtron Products. The E-IBD Air Curtain is an ideal solution for climate and insect control. An invisible "wall of air" prevents conditioned air from leaving, and outside air from getting in. The Pest-Pro 150 Bug Light, discretely eliminates insects in a silent and clean manner - helping to keep your establishment sanitary and insect-free! Contact Curtron at 800.833.5005 or info@curtronproducts.com Pest-Pro 150 Bug Light (shown in white) E-IBD Air Curtain (shown in stainless) Climate and Insect Control at it's Finest. Keep the Bugs out so your Customers stay In! What do operators need to know about complying with the FDA Food Safety Modernization Act (FSMA)? Anthony Ziglear: About 48 million people in the U.S. get sick; 128,000 are hospitalized, and 3,000 die each year from foodborne diseases, according to recent data from the Centers for Disease Control and Prevention. This is a significant public health burden that is largely preventable. The FSMA is transforming the nation's food safety system by shiȅ- ing the focus from responding to foodborne illness to preventing it. Congress enacted FSMA in response to dramatic changes in the global food system and in our understanding of foodborne illness and its consequences. 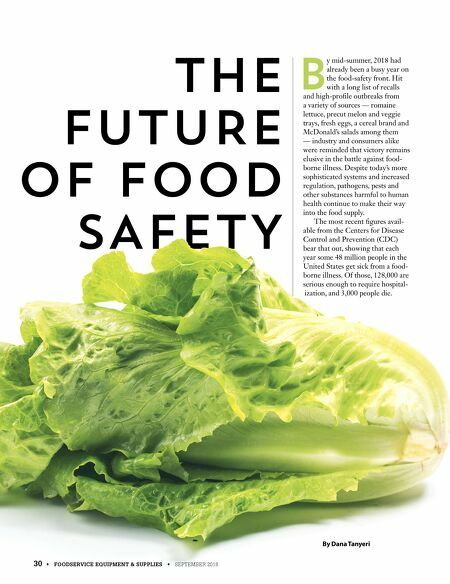 FSMA realized that preventable foodborne illness is both a significant public health problem and a threat to the economic well- being of the food system. How do Curtron's air curtains and Pest-Pro flying insect traps help operators maintain food safety? AZ: We have a primary and secondary approach to ensure restaurants and institutions are protected from flying insects. First, we use high- velocity air curtains above all entrances into a facility, most notably the service doors leading directly into the kitchen and the front door where customers will enter the facility. The velocity of air generated is accept- able to stop flying insects from entering the building. The secondary defense is our Pest-Pro units, which have black lights to attract the insects and a hidden glue board to catch them in a sanitary fashion. We feel confident that these two defenses will limit the number of insects in any foodservice facility. 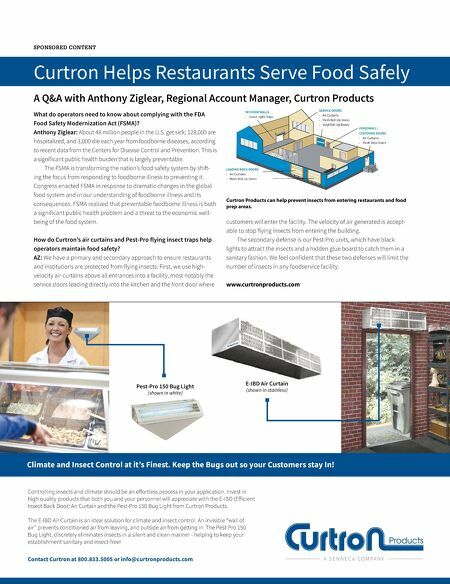 www.curtronproducts.com SPONSORED CONTENT Curtron Helps Restaurants Serve Food Safely A Q&A with Anthony Ziglear, Regional Account Manager, Curtron Products Curtron Products can help prevent insects from entering restaurants and food prep areas.